I love taking time over breakfast on Bank Holidays, but I don’t like going to my usual brunch haunts – finding somewhere that’s open can be a bit hit-and-miss, the crowd is different and town lacks its usual Saturday (or even Sunday) morning buzz. So the best option is to make breakfast yourself, and with berries, herbs and stone fruit all in season for the June Bank Holiday, the options are endless. 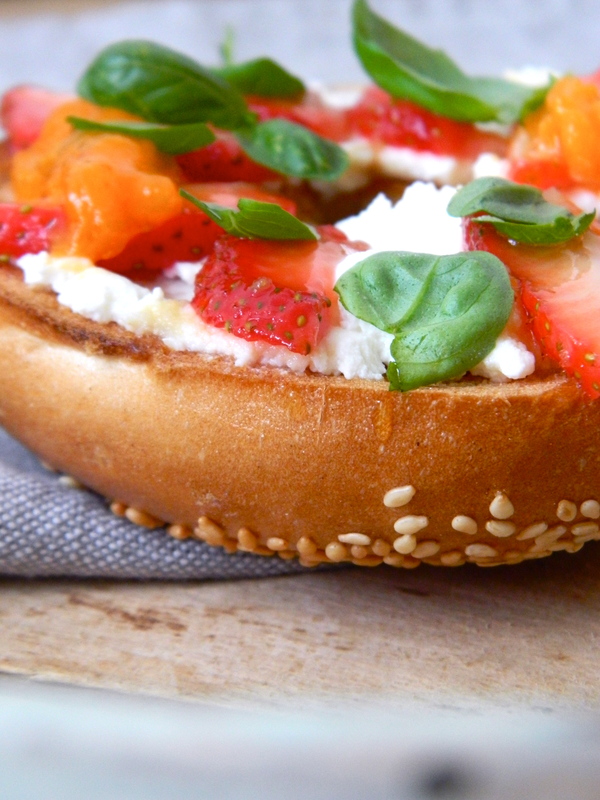 I decided to have a toasted sesame-seed bagel with ricotta, macerated strawberries and poached apricots for breakfast, finished with a little honey and some baby basil leaves – lovely. This dish could be put together in a myriad of ways – you could serve the lemon syrup-poached apricots warm or cool, you could try grilled watermelon rather than the strawberries, you could leave the strawberries unadorned or you could use fresh mint rather than basil. Poach the apricots in the lemon syrup/water-lemon-sugar mix until very soft and leave to cool, adding the 2 basil leaves after you’ve taken it off the heat. Taste and add a little more sugar if necessary. Once cool, add the whole strawberries and leave to macerate for about ten minutes. Toast the bagels and leave to cool. 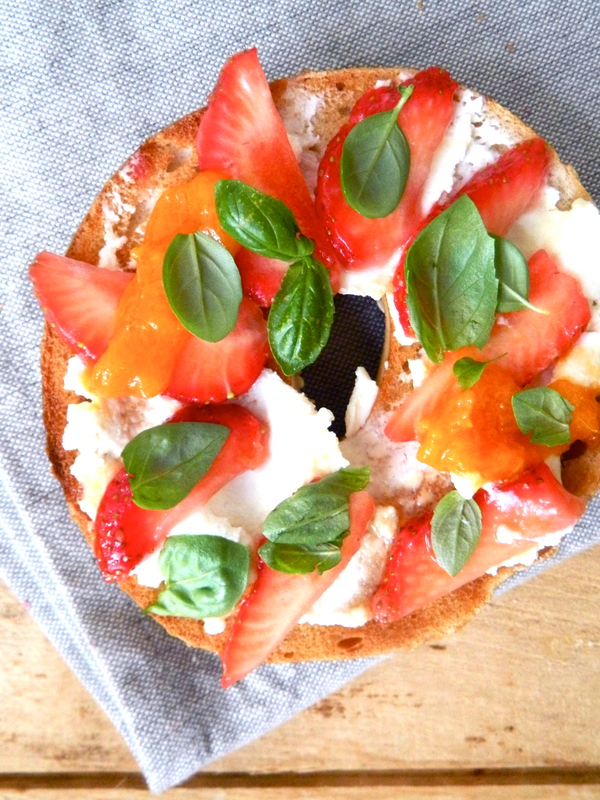 Spread the ricotta thickly on the bagel halves, slice the strawberries and arrange on top and dot the poached apricots on top. Spoon a little of the apricot liquor over the strawberries and add the basil leaves. 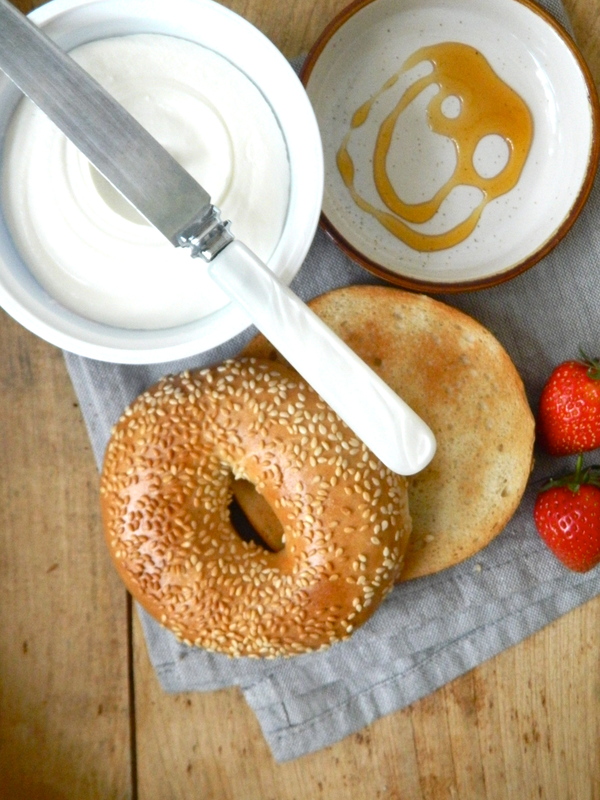 Drizzle some honey over the bagels and serve immediately, with lots of hot black coffee and yesterday’s papers.